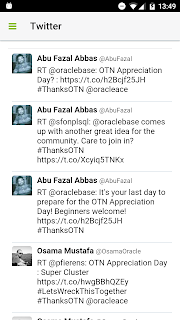 Oracle MCS offers different levels of lifecycle management and in this post I am going to focus on the lifecycle management (versioning) of the different artifacts such as Mobile Backends, Custom APIs and their implementations, etc. These artifacts can have two different states: draft and published. When you publish an API it is frozen becasuse it is not safe to modify it, if you modify it you can cause problems in the different components that are using it. This is why versioning is one of the key points that you have to keep in mind when developing APIs. 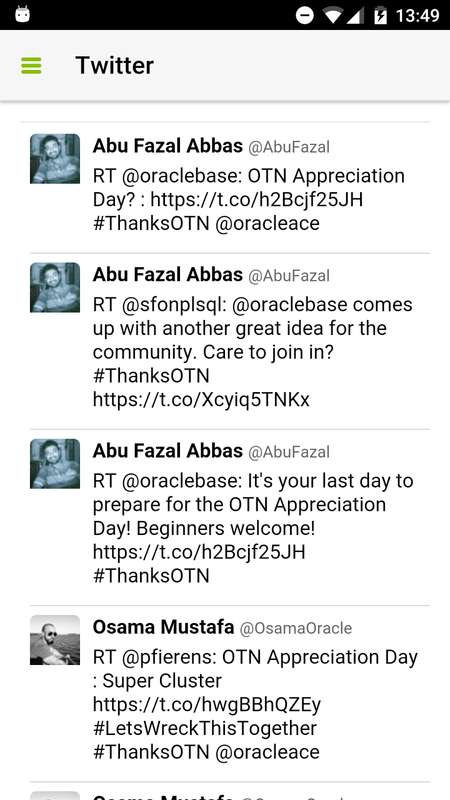 In this example we are going to suppose that we have a mobile app that consumes Twitter API from Oracle MCS. As you might know, in order to consume twitter API you need tokens that you can get when you create your application in Twitter Platform. One option we have is to have, for example, a JSON file, or even a json with the different values inside our API implementation file. But, is this the correct way of doing it? Well we might think that there is no problem, and we can even change the implementation of an API once it is published so if we need to change these values we can create a new version of the API and upload it to MCS. A part from the trouble we can cause if by mistake we change any other line of code, following this option we make our API to be tied to a specific application. We will not be able to make other application that requires different credentials. Oracle MCS provides us the hability to create 'App Policies' inside the Mobile Backends (we will usually have one Mobile Backend consumed from one application) so we can have reusable APIs that can be used within different Mobile Backends with different configurations. So inside the Mobile Backend we are going to create four policies, one for each of the values that we need. You can easily get the values from these App Policies using a Platform API. If we test it we will get a JSON with the values. Once the Mobile Backend is published, you will not be able to create new policies or delete an existing one, but the cool thing about is that you can modify their values. So, once we have modified the values, we don't even need to save anything. And next time we execute the API we will get the new values. When we want to create a new Custom API, we have to define the each of the endpoints and, if we want to consume them from Oracle MAX, we have to define the schemas and then add some mock data. Since version 16.4.1 (v3.0), there is a new feature, Express API, where we can create the resources and the schemas easily and declaratively. I have to say that we can still create the APIs in the old way. But if we want to use Express API, we just have to select that option when creating an API. The creation popup is the same as in previous versions. But the API page is different. We no longer see endpoints, schema, security, types and traits menus, and instead of those we have resources menu option. After creating a resource, we can see 4 tabs. In the first one we can change the configuration of the resource and we can also define child and parent relationships between resources. The next tab is fields. This is the way we start defining the schema of the API. Using this feature will result in the automatic generation of the schemas. Another tab is Methods. By default there are 5 methods created for CRUD operations, although we can create custom methods. The last tab is to provide sample data. Before the Express API we had to manually build the json and now we can insert as many rows as we want using this form. Now that we have finished to define our API, if we test it we can see the that the data is returned by the API, and we are ready to implement the API and create our MAX application. There are some cases when we need to get a value associated to the new value that we have selected in a selectOneChoice, or that we have typed in an inputText. In this cases we will not be able to get that value, as the only thing we can do is to get the new value from the ValueChangeListener object. In this example we are going to use HR schema and we will have Employees view object. In DepartmentId field we are going to create a List of Values to show the DepartmentName value in the selectOneChoice. We are also going to add DepartmentName field from Departments view into Employees view. If we have to drag and drop the Employees view from the data control palette into our page and create a form. In DepartmentId field component, we have to set autoSubmit to true and create a valueChangeListener. If we print the values in the method. To get the value from the attribute bindings I am using resolveExpression method that can be found in JSFUtils class. We can see that the model value will be always the previously selected value. To display the new value associated to the selected one, we need to force the update model calling procesUpdates method. If we run again the application we can see that the selected value is displayed. In this 3-part post series I will show how to build an Oracle MAX Application that will display the medal standing in Rio 2016. This is what we are going to do in order to achieve our goal. First we are going to use Oracle MCS internal database to store the urls of the flags that we will display in the application and we will also create a custom API to retrieve the records from the database. The second step is to design and implement the API that we will consume from the MAX application. We will get the rankings using rio2016 node module that can be found in github. Let's start! The node module that we are going to use to retrieve the standings doesn't give us the flags url so we need to get them. At this moment we can display either static or remote images in Oracle MAX, but the source of the image has to be its absolute url, we cannot display images from MCS Storage. This would be a great feature to have. I stored in a server lots of flags, but we need to know what url corresponds to each country and we will use MCS Database to do it. First we are going to create a custom api 'RankingCountries'. In security tab we have to disable 'Login Required' so we don't have to deal with users at this point. In endpoints tab we have to create 3 of them. /load (POST method): we will use this to load the data intro the database. /countries: Returns all the countries. Now we have finished the design. It's time to start the implementation. This is the first implementation we have to make, the one to load the data. As you can see we are storing the data that we will provide in the body of the POST call into 'Country' table, where the primary key of the table is 'code'. The this Platform API will create the table if it doesn't exists. This is the json we have to provide. The code is the value that we will get from the node module that returns the standings. The second implementation is the one that returns one country. We need to provide 2 parameters in this method of the Databse Platform API. The first one is the name of the table, and the second one is the value or values of the primary key. If we don't find the flag in the database we are going to return the Unknown flag. We have finished the implementation. In implementation tab we have to upload the .zip file into MCS. Now it is time to test everything. After executing the load operation we ar ready to test the two GET operations. The first one, providing an id that does not exists, returns unknown flag values. And if we run Countries GET operation we get all the values form the database. OOW 2016 Session: "Going Mobile with a Hybrid Cloud and On-Premises Architecture"
I am glad to write this post because I have been selected to present a session in Oracle OpenWorld 2016 along with Javier Barrio, avanttic Sales Director. The name of the session is "Going Mobile with a Hybrid Cloud and On-Premises Architecture" and we will present the customer success of the Oracle Mobile Cloud Service project that avanttic finished some months ago. And of course don't miss the chance to assist to our session in September. This is not a new component as it was released with version 12.2.1 back in November but it deserves a mention as it allows us to easily create responsive user interfaces. Although we were able to define media queries in our css and skin files, this component allows us to change component properties according to the screen size.